Find more decorating and design ideas on our dedicated hub page. Greet your guests with an expected blast of colour by painting your staircase yellow. It can actually be a pretty budget friendly way to upgrade your hallway, especially if you take it on yourself as a weekend project. You can technically use any yellow wood paint, but we recommend picking one that's designed for floors as they are going to be the most durable. Check out our guide to how to paint stairs to recreate this yellow hallway look yourself. Looking for yellow living room ideas? We know a yellow sofa may sound like a daring choice, and sure if you go for a canary take on the shade it will make a bold a statement, but choose a more muted hue (ochre, mustard, chartreuse ) for a sofa that won't steal all the focus. We love the boho vibes of this yellow living room: the subtle, honey tones of the sofa means you can pile on all the textures and tassels without it looking over the top. Love this living room? Make sure you check our more of our boho living room design ideas and to shop all of our favourite yellow sofas head over to our buying guide. Instagram has been filled with blue and yellow decorating ideas for what seems like forever, but while there is a definite trend towards the navy and mustard combo, we think a muted yellow and a cool toned but zesty blue are just as Insta-worthy a match. If you are trying to tweak your living room on a budget or just don't want to commit to a yellow sofa, buying a couple of yellow throw cushions is probably all you need to bring the sunny vibes into your home. Add a mustard throw and switch out window treatments to some yellow curtains and add a yellow living room rug to tie the whole look together. And gold counts and yellow right? So throw in some metallic accessories too. Painting the walls? Pfft that's so last year. Yep, our love of the feature wall is fading, and is being replaced by painted ceilings. Be inspired by this yellow room idea and pick a paint with a chalky finish (something like Annie Sloan Arleswould be and ideal yellow living room paint) for the lovely rustic look you can see here, bring it down the walls just a little bit and keep the rest of your walls white. Tie the rest of the room together by adding a few pop of yellow in the form of cushions. This is definitely a job you could tackle yourself, just go and have a read through our guide to painting a ceiling. Oh look, the blue and yellow combo is back, but we love how the creamier tone of Dayroom Yellow used in this yellow living room makes more of a subtle statement than in the space above. Plus, by using a softer yellow paint there is still plenty of room for a fairly bold patterned wallpaper. If you after after bold yellow room idea, painting the floorboards is a sure fire way to add plenty of this on trend colour. It's a great way to transform a room on a budget, especially if you can tackle the job yourself (check out out guide to painting floorboards to find out how). These floorboards have been painted in cheery Babouche from Farrow and Ball – we love that this particular yellow is bright but not garish so perfectly suited to larger areas. If painting the floors and ceilings sounds like too much of a commitment to the yellow room idea decor trend, add a splash of yellow by painting a smaller section of your room, like an alcove or a fireplace. Yes, yes we know we said we are over feature walls, but let's be honest we will never really stop being amazed by their ability to transform a space with minimal effort. If you are painting a smaller surface area you can probably afford to go a bit brighter too, so choose a zesty shade like Little Greene's Trumpet. Nothing adds interest to a room quite like a full-wall dramatic yellow mural. These over-scaled features may look expensive and time consuming but there are really affordable wall mural options out there, and putting them up is pretty similar to hanging wallpaper. We love how this Oriental-style yellow mural works as a backdrop for that electric pink velvet sofa. Check out more of our favourite wall mural ideas in our feature. It can be hard to relax in a sunshine yellow bedroom, so if you do want that vitamin D placebo, we recommend a more muted shade for your four walls. Add plenty of contrast by keeping your woodwork a bright white and pick out white furniture too. Can we also note how great the black lamp looks against the yellow wall? For more bedroom paint ideas check out our feature. A much quicker way to add yellow to your bedroom is to switch up your bedding. This set from Dunelm has plenty of grey mixed in so you have a dreamy ready-made colour scheme going already. Add even more yellow hues to your room by changing up any prints or pictures you have dotted around the space; find images that have yellow as the key colour to tie the look together. Thinking that a whole yellow wall may be too much for your space? Take a cue from this beautiful yellow bedroom and go halfies, painting the bottom portion of your walls yellow and combining it with a monochrome wallpaper. Etsy have loads of gorgeous tropical print wallpapers and check our out gallery of the best botanical wallpapers too, for more inspiration. Picking a paint colour scheme for a kid's bedroom or a nursery? Yellow is perfect if you are going down the gender neutral route. Make a practical window treatment more of a feature by painting them in a zesty yellow. These ones by California Shutters have been painted in Dulux’s Spring Breeze 2, and the colour has been carried through to the wall in the form of those funky mountain shapes. Oh, and if you don't fancy having a go at painting those tiny intricate stars, you can find similar wall stickers at Not on the High Street. Make sure you go and have a read through our guide to the best paint for kids' bedrooms to make sure you pick the most durable, wipeable, long-lasting paint available. Shutters from California Shutters, painted in Dulux’s Spring Breeze 2, chair from Sklum, similar beds from The Original Bed Co. If your kitchen doesn't get a ton of natural light, adding a healthy dose of yellow is guaranteed to brighten up your space. if you are feeling brave you could go for sunflower yellow kitchen cabinets, if you are up for painting kitchen cabinets yourself, this could be a budget-friendly way of updating your space. Keep the look fresh by add a few pops of navy blue, bright white and grey. Check out our guide to the best paint for kitchen cabinets too. If you are after a more understated way to add yellow to your kitchen, just add a few accents of this poppy colour through your kitchen accessories (think cute yellow plates you can keep on show, yellow utensils, yellow fruit bowls, you get the idea) , kitchen appliances (yellow kettles, yellow toasters, yellow KitchenAids all exist) or take a tip from this gorgeous kitchen and change up your current dining chairs with these yellow Eiffel chairs. Yellow kitchen accessories not going to be enough for you but full on yellow kitchen cabinets a bit too much? Strike a balance by painting a small section of your kitchen in a sunny yellow paint. You could go down the feature wall route, or you could pinch this idea and paint around the frame of your windows and doors – enough but not too much. 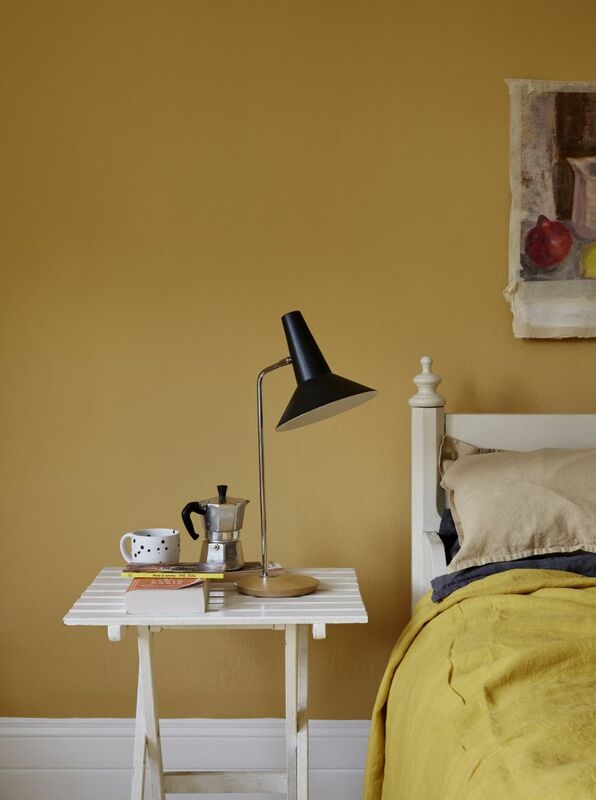 For a more traditional take on a yellow room design, choose a light, creamy, primrose colour. Something like Farrow & Ball's Dayroom Yellow would work really well in a yellow hallway as makes even a light-deprived space feel brighter and more welcoming. Check out all of our hallway paint ideas in our guide or if you are after more tips on picking paint for a period property, we have lots of tips over in our feature. Yes, you read that right, yellow and brown. But this '70s' combo is making a come back, and we think when used in small doses it can really work. We love the retro tone of Little Greene's Starflower wallpaper, pair it with some Mid-century furniture and some statement yellow lighting to complete the look. Check out more Mid-century modern decorating ideas in our feature. Love the sound of a yellow bathroom? Go bold with a yellow freestanding tub. The Albion Bath Company has loads of lovely freestanding baths (even really, really diddy ones if you are working with a small bathroom – read our guide if you're designing a tiny room), all of which can be painted in your choice of Dulux or Farrow and Ball's paint, for a similar yellow paint to the one below we recommend Dulux's Yellow Punch. In this yellow and grey bathroom a bright, the pale pastel yellow is made to feel just a bit more grown up when combined with a light grey, plus the stripped back wooden floors and modern white furniture stop it from becoming too saccharine. Find more bathroom paint ideas in our guide; and don't miss our best bathroom paints buyer's guide so you can be sure of choosing the right finish.